Why does demand planning, which is really just a fancy term for sales forecasting, come after studying your competitors and market expectations? When you start sales forecasting, you’d already be identifying your sales unit by month, as well as setting the average selling price. Studying the market beforehand gives you a clear overview of what you should forecast. Sales forecasting is not about guessing the future accurately. Instead, it is about making “informed guessing”. This practice lays out assumptions, sets expectations and helps you understand sales drivers, followed by regular tracking and management. You set sales forecasting before creating your first collection, so you’ll work with a set budget. You count all of the costings first before forecasting sales. I would recommend going with the top-down option because you may have a tendency to create a larger budget than necessary with the latter. Identify various sales channels, which was what we discussed in course 1.6. The minimum units required to sell every month to achieve minimal profit level. Predict high and low sales months based on key events, for e.g. Spring launch (newness), Black Friday (sale event) or Christmas (festivity). The forecast should differ by channel, given its differences in consumer demographics. The cost of goods sold which determines the selling price and gross profit margin. 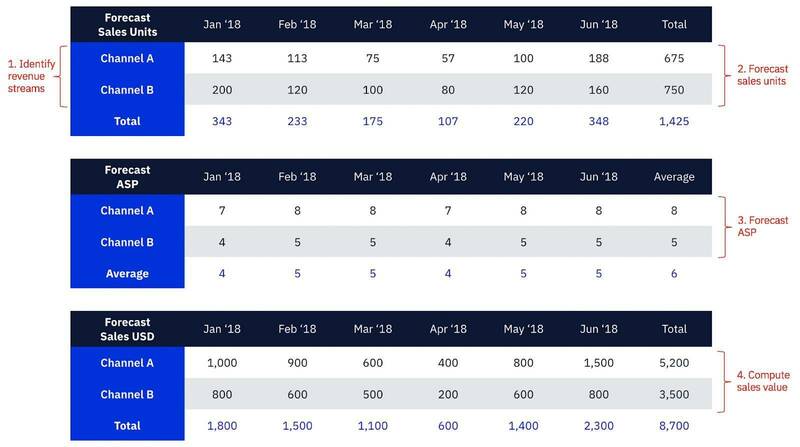 Predict months with higher ASP (new season launch) and low ASP (promotion/sale). All channels can share the same monthly ASP forecast for a start. The formula is sales unit (from step 2) x average selling price (from step 3). Once generated, study the numbers to continuously set clear assumptions and understand sales drivers, such as newness, pricing, promotions and conversions. Review forecast against actual results every month, and revise forecast where needed.